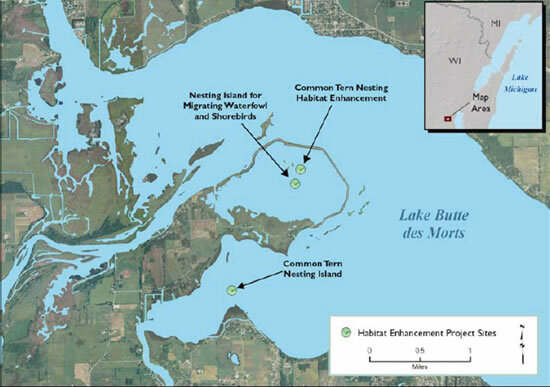 To increase nesting habitat for common terns (Sterna hirundo) and other migrating waterfowl and shorebirds at the Terrell’s Island Habitat Restoration Area on Lake Butte des Morts. Common terns, a state-listed endangered species in Wisconsin, were injured by their exposure to PCBs released into Green Bay. This project involves enhancing nesting habitat for common terns on an existing engineered island and constructing two additional islands to provide nesting habitat for common terns, migrating waterfowl, and shorebirds. The existing 0.5-acre island was constructed in 1997 and 1998 but terns have abandoned the island because growth of tall grasses has made the habitat unsuitable. The restoration project involved renovation of 2,000 square feet of common tern nesting habitat on the existing island by installation of weed barrier fabric, capping with 6-12 inches of sand, and reinforcement of existing rock armoring. 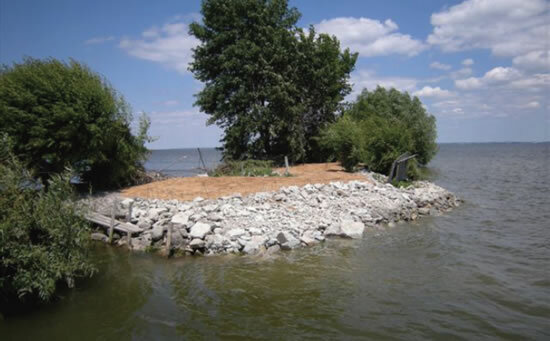 A new 0.1-acre circular island was constructed with clay fill and then capped with stone overlain by fine gravel to create additional common tern nesting habitat. Finally, a 0.3- acre island was constructed to provide nesting habitat for migrating waterfowl and shorebirds. On-going monitoring and maintenance work includes removing vegetation in the nesting area and monitoring for all ground-nesting species, with special attention focused on encouraging common tern nesting populations and minimizing impacts of predatory ring-billed gulls (Larus delawarensis). Island construction and restoration increases available nesting habitat and helps ensure continued population growth and recovery of the common tern. Species associated with common terns and their nesting habitats, such as native grasses and migratory waterfowl, will also benefit from this project. 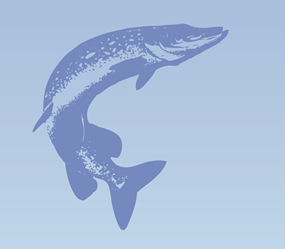 Three separate island projects will benefit approximately one acre within and near the Terrell’s Island Habitat Restoration Area. The projects include: a restored area (2,000 square-feet) on the existing 0.5 acre island; construction of a 0.1 acre island designed to attract nesting common terns; and construction of a 0.33 acre island designed to attract nesting waterfowl and migrating shorebirds will be constructed. NRDA settlement funds account for 100% of the restored and constructed acreage. Renovation of common tern habitat, along with construction of an additional common tern nesting habitat and construction of nesting habitat for migrating waterfowl and shorebirds was completed in 2009. Monitoring and maintenance of these three habitats is on-going. The projects received a total of $145,000 in NRDA settlement funding. Renovation of existing tern habitats along with construction of two new islands was completed in July 2009. These islands will greatly increase the availability of common tern habitat. Ongoing monitoring of the islands will be essential in determining the effectiveness of these habitats in supporting the common tern.